Are you looking for a really good stick, with a big curve in the middle of the stick that looks awesome and comes from a great household name hockey stick brand? Oh yeah, at a reasonable price too. Then you might be looking for the adidas V24 Compo 2 hockey stick. Here’s why. The curve on the shaft of these adidas hockey sticks is a dream. Because the V24 Compo 2 has the XTREME24 shaft mold it gives you a great mix. Until recently I have always preferred the straighter sticks with a smoother curve. Because the curve in the shaft of the XTREME24 mold starts high, it initially has this straighter characteristic. However unlike many of the higher bows sticks available in the market, the adidas V24 has a very distinct bow at 300mm up from the floor. This means the bend doesn’t feel quite as intimidating as the lower bow sticks, however despite that it still seems extreme compared to hockey sticks with a smoother curve. What does this actually mean? Well imagine being back towards a defender and you notice a pass out wide. If like me you don’t have the speed to slap the ball under pressure you want to make a push pass. The slingshot effect given by a dramatic curve will transfer more power to your push pass. 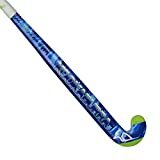 On the contrary because the adidas V24 compo 2 hockey stick review has a higher bow position you will find that dribbling, receiving, straight bat passes or shots and even slap hits will perform more like a straighter bat. It is a great compromise in my opinion and the adidas V24 Compo 2 will defiantly be my next hockey stick. It is worth saying that the adidas V24 2015 Compo 2 model is quite expensive considering the material composition. You can get a much higher carbon fibre weighting in hockey sticks for less money. Possibly you are paying for the brand, you will pay a little more to carry a stick that resembles so many you see in the international game of field hockey. However you will struggle to find a shaft bow like this on many other sticks and that carry’s with it significant value. Aside from the hockey stick bow position the adidas V24 is great in other areas too. Reinforcement of impact areas is one of those features that add value to the adidas V24 Compo 2 hockey stick. You will see this a lot in other marketing of the stick, what it actually means is that the face and the leading edge on the reverse side have aramid reinforcement. This reinforcement does a couple of things, the first is to make it more durable and long lasting in areas which normally take a beating on the hockey field, especially the edge that gets clips when hitting hard on the reverse. Additionally this reinforcement provides some extra rigidity on the main hitting areas, which will effectively make the hockey stick hit the ball harder. This is a nice feature of the adidas V24 Compo 2 because it does have quite a low carbon fibre content considering its price and position in the adidas range. At 50% carbon fibre, 45% fiberglass and 5% other (this is where the aramid is included for the reinforced areas) you can expect the V24 Compo 1 to be less stiff than more carbon rich models. Is that reduced amount of carbon fibre a problem? I don’t think so. When choosing a hockey stick you must get one that is going to suit you and your game rather than being soley focused on its carbon content. More carbon fibre will increase the stiffness of the hockey stick and reduce the feel you get up the grip of the ball. As already discussed the adidas V24 Compo 2 is not designed for the hard hitters out there, 50% carbon still makes this hockey stick powerful enough for most club players. Taking in to account all the key factors of consideration when providing a review of a hockey stick, the 2015 model adidas V24 Compo 2 fits the bill in so many areas. It’s bow shape is really the number one feature of the adidas V24 Compo 2. If you are finding low bow hockey sticks to bent and other smoother bows to straight this hockey stick is the perfect mix. The hockey stick looks fantastic, the blue and bright yellow mix together really well and the handle is really vibrant. You will look cool and be extremely competent on the hockey field with the adidas V24 compo 2 hockey stick. You will love the adidas V24 compo 2, it’s not cheap but it provides a mix of features and technology that is hard to find. The decent, all action midfielder should be buying this stick to continue performing week in, week out.